The ancient Hebrews were farmers, fishermen, artisans, etc., very seldom merchants. Solomon's endeavors to stimulate commerce among them bore no lasting fruit. Outside of their country they were not always allowed to acquire real estate and had to give way to the native inhabitants in working the soil, and they were thus gradually alienated from agriculture, although Jewish farmers are met with in all colonies, except perhaps in Alexandria, down to the twelfth century, especially in Persia, Asia Minor, Syria, and the East generally. In Germany, until the Crusades and the rise of the Italian republics and the German bourgeoisie, the Jew was the merchant par excellence; and special privileges were granted him by the emperors. Rich Jewish merchants were to be found in Ratisbon, whither Oriental merchandise was carried up the Danube from Constantinople, and whence the goods were distributed. In eastern Germanythe Jews were still the chief factors in commerce as late as the fifteenth and sixteenth centuries. Two-thirds of the traders between Poland and Silesia were Jews, who monopolized the trade in coffee, tobacco, and sugar. They carried sugar-cane from Madeira to Brazil as early as 1548, and from Candia they brought to Vienna cane-sugar, which could be used at Passover. They imported also spices from what was a great distance in that day; and for Sukkot they brought myrtle from France and lemons from the Mediterranean countries. In the twelfth century in Mediterranean countries, such as Italy, Sicily, Greece, and Palestine, large numbers of Jewish dyers existed; in Salonica, artisans and silk-manufacturers; in Antiochia, glass-workers; in New Tyre, ship-owners. In Sicily Jews were engaged as architects, miners, clerks, smiths, locksmiths, weavers, and silversmiths. In that island and in Calabria they monopolized for years the manufacture of silk, paying highly for their privileges, until they were driven from the markets by Christian merchants of Lucca and Genoa. A Jew is mentioned as the inventor of the clepsydra (for the lightning-rod and telescope, as well as artificial and filled teeth among the ancient Jews, see "Jüdisches Litteratur-Blatt," vi. 166). Jews are mentioned also as card-painters, sword-smiths, sculptors, and bookbinders. Illuminating they learned from the monks. They showed much skill as silversmiths and goldsmiths (in 1466 there was a Jewish silver-manufactory at Trevona). In Holland there were many Jewish diamond-cutters and glass-workers (e.g., Spinoza). (On the Jews of Prague see Prague.) Printing, as a "sacred art" ("meleket ha-ḳodesh"), was practised enthusiastically, often at the risk of life. 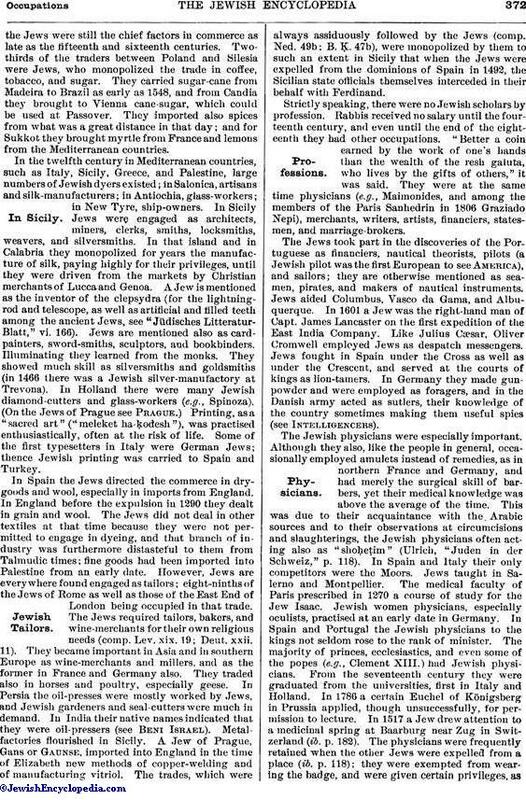 Some of the first typesetters in Italy were German Jews; thence Jewish printing was carried to Spain and Turkey. In Spain the Jews directed the commerce in dry-goods and wool, especially in imports from England. In England before the expulsion in 1290 they dealt in grain and wool. The Jews did not deal in other textiles at that time because they were not permitted to engage in dyeing, and that branch of industry was furthermore distasteful to them from Talmudic times; fine goods had been imported into Palestine from an early date. However, Jews are everywhere found engaged as tailors; eight-ninths of the Jews of Rome as well as those of the East End of London being occupied in that trade. The Jews required tailors, bakers, and wine-merchants for their own religious needs (comp. Lev. xix. 19; Deut. xxii. 11). They became important in Asia and in southern Europe as wine-merchants and millers, and as the former in France and Germany also. They traded also in horses and poultry, especially geese. In Persia the oil-presses were mostly worked by Jews, and Jewish gardeners and seal-cutters were much in demand. In India their native names indicated that they were oil-pressers (see Beni Israel). Metal-factories flourished in Sicily. A Jew of Prague, Gans or Gaunse, imported into England in the time of Elizabeth new methods of copper-welding and of manufacturing vitriol. The trades, which were always assiduously followed by the Jews (comp. Ned. 49b: B. Ḳ. 47b), were monopolized by them to such an extent in Sicily that when the Jews were expelled from the dominions of Spain in 1492, the Sicilian state officials themselves interceded in their behalf with Ferdinand. Strictly speaking, there were no Jewish scholars by profession. Rabbis received no salary until the fourteenth century, and even until the end of the eighteenth they had other occupations. "Better a coin earned by the work of one's hands than the wealth of the resh galuta, who lives by the gifts of others," it was said. They were at the same time physicians (e.g., Maimonides, and among the members of the Paris Sanhedrin in 1806 Graziado Nepi), merchants, writers, artists, financiers, statesmen, and marriage-brokers. The Jews took part in the discoveries of the Portuguese as financiers, nautical theorists, pilots (a Jewish pilot was the first European to see America), and sailors; they are otherwise mentioned as seamen, pirates, and makers of nautical instruments. Jews aided Columbus, Vasco da Gama, and Albuquerque. In 1601 a Jew was the right-hand man of Capt. James Lancaster on the first expedition of the East India Company. Like Julius Cæsar, Oliver Cromwell employed Jews as despatch messengers. Jews fought in Spain under the Cross as well as under the Crescent, and served at the courts of kings as lion-tamers. In Germany they made gunpowder and were employed as foragers, and in the Danish army acted as sutlers, their knowledge of the country sometimes making them useful spies (See Intelligencers). The Jewish physicians were especially important. Although they also, like the people in general, occasionally employed amulets instead of remedies, as in northern France and Germany, and had merely the surgical skill of barbers, yet their medical knowledge was above the average of the time. This was due to their acquaintance with the Arabic sources and to their observations at circumcisions and slaughterings, the Jewish physicians often acting also as "shoḥeṭim" (Ulrich, "Juden in der Schweiz," p. 118). In Spain and Italy their only competitors were the Moors. Jews taught in Salerno and Montpellier. The medical faculty of Paris prescribed in 1270 a course of study for the Jew Isaac. 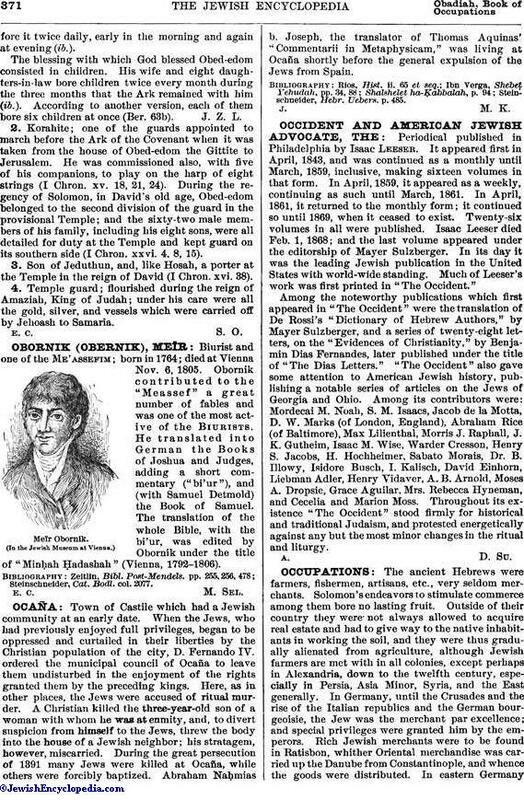 Jewish women physicians, especially oculists, practised at an early date in Germany. In Spain and Portugal the Jewish physicians to the kings not seldom rose to the rank of minister. The majority of princes, ecclesiastics, and even some of the popes (e.g., Clement XIII.) had Jewish physicians. From the seventeenth century they were graduated from the universities, first in Italy and Holland. In 1786 a certain Euchel of Königsberg in Prussia applied, though unsuccessfully, for permission to lecture. In 1517 a Jew drew attention to a medicinal spring at Baarburg near Zug in Switzerland (ib. p. 182). The physicians were frequently retained when the other Jews were expelled from a place (ib. p. 118); they were exempted from wearing the badge, and were given certain privileges, asin Hamburg. Neither the "Jus Canonicum," ch. xiii., "Christiani a Judæis non possunt recipere medicinam," nor the "Statuta Synodalia Basiliensia," nor even the decrees of Gregory (1581) and Paul IV. that Christians who were treated by Jews should receive neither sacrament nor burial, were heeded (see Medicine). Usury, which became to the Jews of the Middle Ages at once their salvation and their bane, was not original with them. The Talmud (B. B. 90; B. Ḳ. 84) classes the usurer with the murderer, neither of them being able to atone for his crime. It even forbids the acceptance of interest (Weiss, "Gesch. der Jüdischen Tradition," iii. 314), and in the Middle Ages even the small interest of the pawn-shops was considered as usury. Not only were the Jews forced to take interest because they were excluded from all other businesses, but they were even compelled to do so by the authorities, inasmuch as the Christians were forbidden by the Church up to the sixteenth century to engage in money-lending (see Usury). The Church up to the thirteenth century considered slavery legal, while the Jewish law not only forbade entirely the keeping of slaves, but also enjoined the redemption of Jewish prisoners in order to keep them from slavery, which injunction entailed a heavy burden upon the communities. The employment of Christian slaves or servants was difficult for the Jews because their ritual forbade them to accept many services, such as the handing of wine, etc. It must be noted the Church in forbidding the Jews to keep slaves referred to Christian slaves only. Gregory the Great says: "Quid enim sunt Christiani omnes nisi membra Christi? atque ideo petimus quod fideles illius ab inimicis eius absolvitis." Gelasius permitted the Jews to import pagan slaves from Gaul, as did also Charlemagne. Especially in Bohemia the Jews conducted the sale of Slavonic slaves for body-guards to the califs of Andalusia. I. Abrahams, Jewish Life in the Middle Ages, xi. 211-229. The means by which Jews earn their livelihoods are still largely determined by the restrictions which until very recently were placed upon them. Owing to the monopoly of the handicrafts by the gilds, the normal number of artisans was not found among medieval Jews, while the restrictions as to the holding of land limited the number of agriculturists among them. As regards the callings themselves, the adoption of certain handicrafts by Jews is often determined by religious considerations; thus, butchers are required for kasher meat, and printers for prayer-books. Generally speaking, those trades are most favored by Jews which afford them opportunity to arrange their own hours of work, thus leaving them free for their religious duties. The tobacco and fruit trades fulfil these requirements. Piece-work rather than time-work, domestic industries rather than factory labor, are for the same reason especially favored. Algeria Money-changers, jewelers, linen-drapers, pawnbrokers, speculative builders. Arabia Armorers, silversmiths, masons, butchers. Asia Minor Servants, porters, merchants. Bagdad Merchants, shopkeepers, money-changers, goldsmiths, pedlers, weavers, bootmakers. Bosnia Handicraftsmen, pedlers, usurers, interpreters, cashiers. Bulgaria Corn-dealers, hide- and silk-merchants. Caucasus Leathermakers, dealers, tobacco- and wine-merchants. Constantinople Merchants, hawkers, gold-changers, physicians, apothecaries, dentists. Damascus Bankers, merchants, shopkeepers, pedlers, bakers, painters, butchers. Egypt Money-changers, bankers, jewelers, merchants, hawkers. Hungary Merchants, hawkers, physicians, journalists, pedlers, innkeepers, photographers, musicians, packers, handicraftsmen. India Agriculturists, oil-manufacturers, soldiers (Beni- Israel). Morocco Dealers, brokers, laborers, interpreters, carpenters, tinsmiths, tailors, bootmakers. Persia Silk-spinners, glass-grinders, goldsmiths, jewelers, hawkers, clothesmen. Russia Butchers, carriers, capmakers, shoemakers, tailors, a few smiths, locksmiths, glaziers, carpenters, musicians, agents. Turkestan Silk-merchants, painters, brandy-distillers, commissionnaires. It may perhaps be worth while to mention that the total number of adult Jews and Jewesses treated in the foregoing table was 129,587. Percentage of Adult Workers Alone. The details for Budapest are not sufficiently well arranged to admit of easy comparison with other creeds, but the general result shows that while every fourth Jew is engaged in commerce, only one twenty-fifth of the general population is engaged in business, and service attracts one-twelfth of Jews as compared with one-eighth of the remaining creeds. One-thirteenth of the Jews are tailors; one-eighteenth, day-laborers. 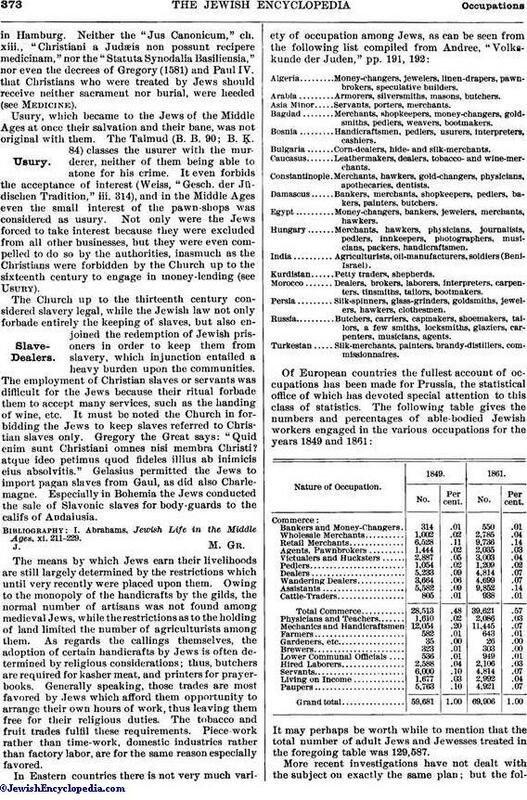 Jews have a higher proportion than those of other creeds in commerce of all kinds, and among goldsmiths, tailors, upholsterers, accountants, insurance agents, medical men, students, and beggars (ib. p. 120). 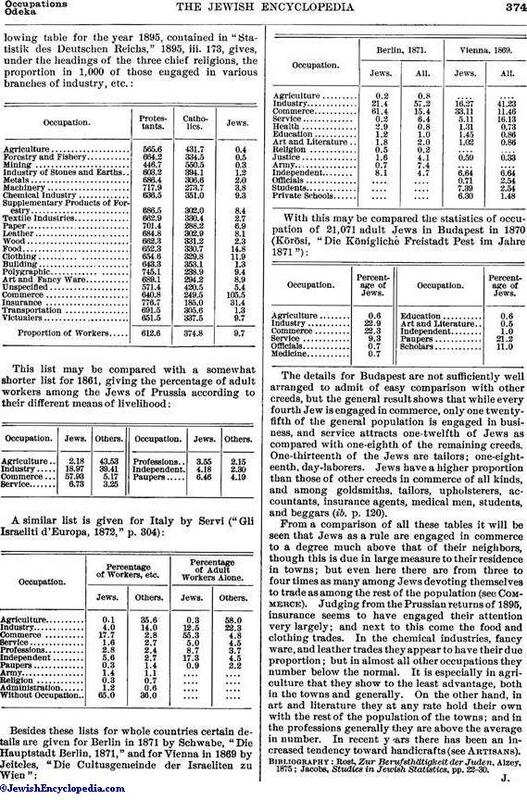 From a comparison of all these tables it will be seen that Jews as a rule are engaged in commerce to a degree much above that of their neighbors, though this is due in large measure to their residence in towns; but even here there are from three to four times as many among Jews devoting themselves to trade as among the rest of the population (see Commerce). Judging from the Prussian returns of 1895, insurance seems to have engaged their attention very largely; and next to this come the food and clothing trades. In the chemical industries, fancy ware, and leather trades they appear to have their due proportion; but in almost all other occupations they number below the normal. It is especially in agriculture that they show to the least advantage, both in the towns and generally. On the other hand, in art and literature they at any rate hold their own with the rest of the population of the towns; and in the professions generally they are above the average in number. In recent years there has been an increased tendency toward handicrafts (see Artisans). Jacobs, Studies in Jewish Statistics, pp. 22-30.